I had been using Shimano M520 pedals for a few years, which were basic, but functional SPDs – they worked well and were cheap. However, they only worked clipped in and if I ever tried to just balance my feet on the pedals unclipped, I regretted it pretty quickly. So I wanted something that gave me the best of both worlds, but with being clipped in still the main use. Shimano have made a number of different SPD pedals with cages over the years, from the original DX metal monsters (yes I had some of those too!) with an SPD pedal stuck in the middle of a DX flat pedal, to the other end of the scale with a flat pedal on one side and SPD on the other, aimed at commuters. Trail pedals are somewhere in between, with a thin light cage around a standard SPD. So I decided to try the XT M785 variant, which I got for what I considered the bargain price of £47 from Merlin Cycles – retail price is £75. In the box you get the pedals and a set of SH51 cleats. 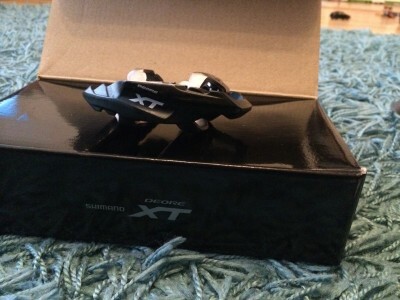 The pedals are based on the XT cross country pedal, with the same lightweight alloy axle and cartridge bearings. Weight is actually less than my old SPD pedals at 408g, which is very impressive with the addition of the cage. That cage gives additional support for your foot when pedalling and acts as a guide when engaging the cleat, as well as making it quicker to flatten the pedal ready for engagement. The key benefit I was looking for, was some grip when clipped out. My favourite local track has a set of rock steps built into a short steep slope, and it’s normally 1st gear & a real knack to getting all the way up – being clipped in is brave! So I gave it a go unclipped and I had all the contact I needed with the pedals (wearing Shimano MT41 shoes) – a great success. Riding round the rest of the trail it was indeed much quicker to stabilise the pedal ready for clipping in, making the transitions out of tight corners quicker. Considering there is barely a weight penalty, with the extra advantages these pedals give, I’d say they would be a vital bit of kit for most people.